South Africa has once more proved that it is a destination of choice for major sporting events after hosting a successful 2013 Africa Nations Cup, says SA Football Association president Kirsten Nematandani. 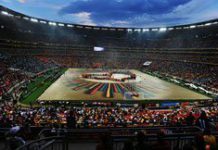 The 2013 Africa Cup of Nations closed with a dazzling musical performance by African artists before Nigeria and Burkino Faso locked horns in front of a packed crowd of 85 000 at the National Stadium outside Soweto on Sunday. 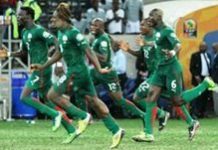 The curtain came down on the 2013 Africa Cup of Nations at the National Stadium in Johannesburg on Sunday evening when Nigeria and Burkina Faso dueled to decide the champion team of Africa. After 94 minutes of action, the Super Eagles had secured their third Afcon title by a 1-0 margin. 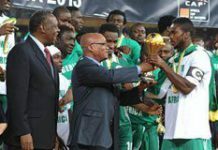 Underdogs Burkina Faso face Nigeria in the final of the 2013 Africa Cup of Nations at the National Stadium in Johannesburg on Sunday evening. Brad Morgan looks ahead to the game. The Confederation of African Football has given South Africa the thumbs-up for hosting a successful 2013 Africa Cup of Nations tournament. 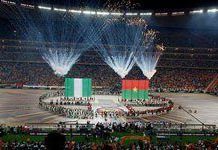 Afcon 2013 ends with a showdown between Nigeria and Burkina Faso at the National Stadium outside Soweto on Sunday. 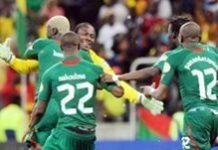 Nigeria and Burkina Faso upset the favourites to progress to the final of the 2013 Africa Cup of Nations in South Africa on Wednesday night. 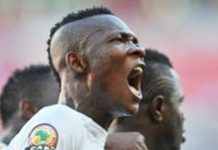 Nigeria were superb in a 4- 1 win over Mali, while Burkina Faso saw off Ghana 3-2 on penalties after the teams had ended extra time level at 1-1. 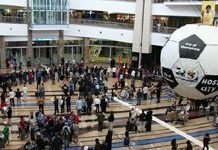 The management of OR Tambo International Airport say they are ready to cater for the influx of passengers into the country for the final of 2013 Africa Cup of Nations, taking place at Johannesburg's National Stadium on Sunday. Bafana Bafana may be out, but support for the 2013 Africa Cup of Nations remains strong. 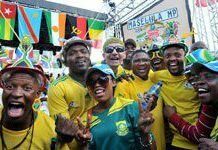 As they did in the 2010 Fifa World Cup, many South African football fans have shifted their support to one of the four remaining teams. Brad Morgan weighs up their chances going into the semi-finals. 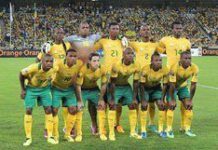 Coach Gordon Igesund praised his charges following Saturday's loss in the 2013 Africa Cup of Nations quarterfinals, saying they had shown great courage and self-belief in getting so far in the tournament, adding that Bafana Bafana had now established a solid platform to build on. 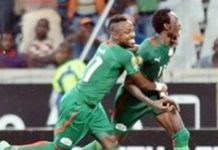 Africa's top-ranked team, Cote d'Ivoire, missed out on the semi-finals of the 2013 Africa Cup of Nations when they lost 2-1 to Nigeria in Rustenburg on Sunday. Burkina Faso completed the semi-final line-up with a 1-0 defeat of Togo after extra time in Nelspruit.